THE OUTDOOR OLYMPIC SWIMMING COMPLEX IS NOW CLOSED. OUR INDOOR POOL IS OPEN YEAR-ROUND! Coolers and outside food are permitted; no cooking, glass, or alcohol please. OPEN YEAR ROUND - with special winter hours! 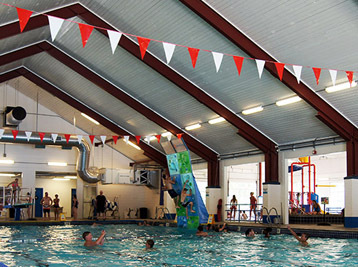 During the summer open swim tickets include the Indoor Swimming Pool with Aqua Climb Wall, Portneuf Kiddie Cove, Hot Tub and 1-meter diving board! Party room available to rent by the hour. Toddlers to tweens can can climb, slide, splash, and giggle on the aquatic toys. Buzz through water flowers, navigate geyserinos, or wait...wait..for the giant yellow bucket to tip over and soak anyone beneath it! Enjoy the indoor pool's new natural mineral water hot pool. The kiddie pool is included with the purchase of an open swim ticket. Our Speed Water Slides have a 60 foot vertical drop with a terminal velocity of 38 mph! Enjoy our amazing Water Park! Must be 48" tall to ride speed slides. Our two curly tube slides rocket visitors around and around leaving them laughing as they splash into the shallow run-out at the bottom! Must be 42" tall to ride curly slides. Open during the summer season and included with admission. The Diving Platform is a thrill for those brave enough to leap from its 5, 7, and 10 meter heights! Four springboards flank the platform tower making this a diver's paradise. An Online Diving Tower Waiver must be signed by any tower user at the Olympic Pool Complex. Those under 18 must have parent or court-appointed legal guardian sign the waiver too. Celebrate your next Birthday Party or special occasion in Lava's Party Room! It is adjacent to the Portneuf Kiddie Cove with several viewing windows into the kids’ pool area. Picnic-style food and beverages are allowed in party room. No glass containers, alcohol, or cooking allowed. 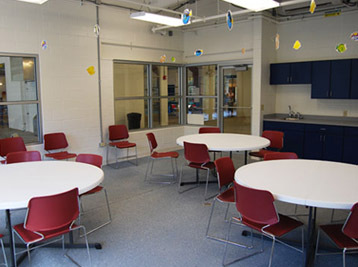 The rental room has sink, countertop, tables and 20 chairs. 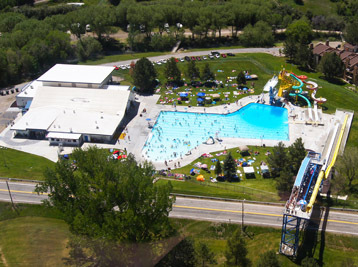 Our Olympic Swimming Complex is the only facility of its kind in the Intermountain West. 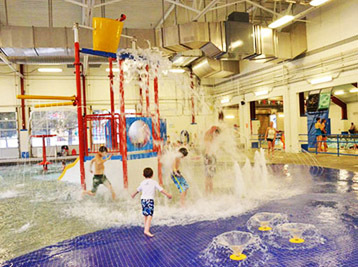 With heated indoor and outdoor pools, diving boards and platforms, waterslides, a natural hot water spa, and the new Portneuf Kiddie Cove, it’s the best kind of fun for kids of all ages. The free form Olympic-size pool holds nearly a million gallons of warm, crystal clear water. This former AAU championship venue is 50 meters long by 8 lanes wide with a full diving set up above a 17’ deep end. The outdoor shallow end offers toys for younger swimmers and ample play room. The diving platform is a thrill for those brave enough to leap from its 5, 7, and 10 meter heights. Four springboards flank the platform tower making this a diver’s paradise. Enjoy exhilarating waterslides for the whole family, including small slides for the kiddies. 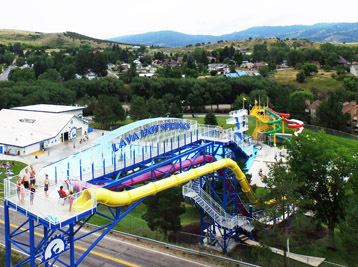 The speed slides’ six-story body flumes send riders screaming into the refreshing runout below. Beware: the 60 foot drop is not for the faint of heart! Two curly tube slides rocket visitors around and around leaving them laughing as they splash into the shallow runout at the bottom. Ample lawns surround the pools and offer an excellent place to picnic, sun bathe, or simply watch the good times unfold. Awnings, umbrellas, and lawn chairs are welcome. Lava is the perfect place for your family reunion and vacation!